Name Variation Matthew Fay was also known as Fahy. Name Variation Matthew Fay was also known as Fahey. Matthew Fay was born in September 1845 at Ireland. He married Rosanna (?) before 1868. Matthew Fay died after June 1900. Matthew Fay immigrated in 1865. [S247] U.S. Federal Census 1870 U.S. Federal Census, by Ancestry.com, Dwelling 3335. [S246] U.S. Federal Census 1880 U.S. Federal Census, by Ancestry.com, NA Film Number T9-0191 Page Number 538A. [S245] U.S. Federal Census 1900 U.S. Federal Census, by Ancestry.com, ED 378. Dwelling 23. Married Name Her married name was (?) Orey. (?) Fay was the daughter of Matthew Fay and Rosanna (?). (?) Fay married John Orey. (?) Fay and John Orey were divorced before 1910. John Orey married (?) Fay, daughter of Matthew Fay and Rosanna (?). John Orey was born circa 1862 at Missouri also reported as Dakota Territory. He and (?) Fay were divorced before 1910. 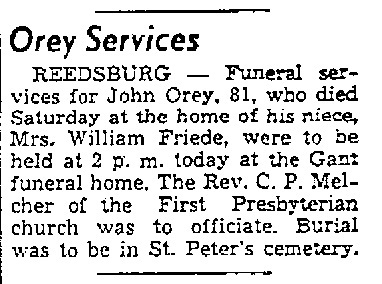 John Orey died on 9 January 1943 John Orey obituary. James Huckstep Dillman married Mary A. Morris. James Huckstep Dillman was born in February 1847 at Ohio. [S246] U.S. Federal Census 1880 U.S. Federal Census, by Ancestry.com, NA Film Number T9-0235 Page Number 352D. [S245] U.S. Federal Census 1900 U.S. Federal Census, by Ancestry.com, ED968. Dwelling 275-366. Married Name Her married name was Dillman. Mary A. Morris married James Huckstep Dillman. Mary A. Morris was born circa 1858 at Illinois also reported as Ohio. Name Variation Laverne Edward Hamilton was also known as Luverne. He was the son of John R. Hamilton and Anna Hoffman. Laverne Edward Hamilton married Ethel Ida McClain, daughter of Charles LeRoy McClain and Mary May Kreiser, on 19 October 1920 at Galena, Jo Daviess, Illinois. Laverne Edward Hamilton died on 30 March 1991 at Platteville, Grant, Wisconsin, at age 91. He was buried after 30 March 1991 at Mount Zion Cemetery, Cornelia, Grant, Wisconsin. 1 June 1905 Smelser, Grant, Wisconsin Laverne Edward Hamilton is listed as son on the census of 1 June 1905 in the household of John R. Hamilton at Smelser, Grant, Wisconsin. Laverne Edward Hamilton obtained US Social Security Card at Wisconsin; last residence not specified. [S358] Wisconsin Pre-1907 Vital Records (published), Reel 0075 Record 001484. [S245] U.S. Federal Census 1900 U.S. Federal Census, by Ancestry.com, Year: 1900; Census Place: Paris, Grant, Wisconsin; Roll: T623_ 1790; Page: 3A; Enumeration District: 47. [S244] U.S. Federal Census 1910 U.S. Federal Census, by Ancestry.com, ED44. Dwelling 103. [S243] U.S. Federal Census 1920 U.S. Federal Census, by Ancestry.com, ED124. Dwelling 138. Year: 1920;Census Place: Smelser, Grant, Wisconsin; Roll: T625_1988; Page: 7A; Enumeration District: 124; Image: 463. Name Variation John R. Hamilton was also known as John Hamilton Jr.
John R. Hamilton was born in July 1867 at Wisconsin. He was the son of John William Hamilton and Rachel Chadwick. John R. Hamilton married Anna Hoffman, daughter of John Hoffman and Gertrude M. Wisbaum, circa 1898. John R. Hamilton died in 1929. 20 June 1895 Smelser, Grant, Wisconsin John R. Hamilton likely is counted on the census of 20 June 1895 in the household of John William Hamilton at Smelser, Grant, Wisconsin; household includes 3 male, 1 female; 2 born in US (sons), 1 born in Great Britain (Rachel), 1 born in Ireland (John). 1 June 1905 Smelser, Grant, Wisconsin He appeared on the census of 1 June 1905 at Smelser, Grant, Wisconsin. [S247] U.S. Federal Census 1870 U.S. Federal Census, by Ancestry.com, Year: 1870; Census Place: Smelser, Grant, Wisconsin; Roll M593_1717; Page: 453B; Image: 514; Family History Library Film: 553216. [S246] U.S. Federal Census 1880 U.S. Federal Census, by Ancestry.com, Year: 1880; Census Place: Smelser, Grant, Wisconsin; Roll 1427; Family History Film: 1255427; Page: 365C; Enumeration District: 125; . Name Variation Anna Hoffman was also known as Annie. Name Variation Anna Hoffman was also known as Mary. Married Name circa 1898 As of circa 1898,her married name was Hamilton. Anna Hoffman was born in June 1877 at Wisconsin also reported as Aug 1882. Anna Hoffman married John R. Hamilton, son of John William Hamilton and Rachel Chadwick, circa 1898. 1 June 1905 Smelser, Grant, Wisconsin Anna Hoffman is listed as wife on the census of 1 June 1905 in the household of John R. Hamilton at Smelser, Grant, Wisconsin. Anna Hoffman had 1 with 1 living in 1900 children. She had 3 with 3 living in 1910 children. 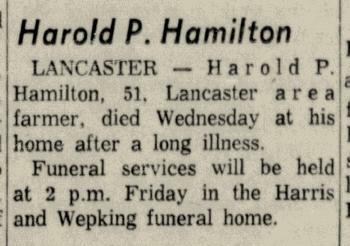 Harold P. Hamilton was born on 19 July 1907 at Wisconsin. Harold P. Hamilton married Florence Mary Reese on 9 August 1928 at Galena, Illinois. 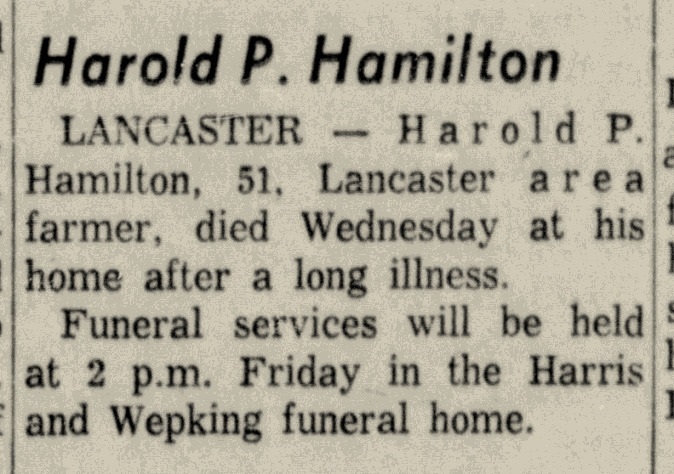 Harold P. Hamilton died on 1 October 1958 at age 51 Harold P Hamilton obituary. Married Name 27 February 1928 As of 27 February 1928,her married name was Wilkinson. Married Name before 1965 As of before 1965,her married name was Niles. Lilace S. Hamilton was born on 13 December 1908 at Wisconsin. She was the daughter of John R. Hamilton and Anna Hoffman. Lilace S. Hamilton married Virgil Wilkinson on 27 February 1928 at Grant, Wisconsin, Lilace Hamilton and Virgil Wilkinson wedding announcement. Lilace S. Hamilton and Virgil Wilkinson were divorced before 1940. Lilace S. Hamilton married John R. Niles before 1965. Lilace S. Hamilton died on 19 June 1999 at Wisconsin at age 90. She was buried after 19 June 1999 at Wisconsin Memorial Park, Brookfield, Waukesha, Wisconsin. [S373] U.S. Federal Census 1940 U.S. Federal Census, by Ancestry.com, Year: 1940; Census Place: Wauwatosa, Milwaukee, Wisconsin; Roll: T627_4503; Page: 4A; Enumeration District: 40-76. Married Name before 1940 As of before 1940,her married name was Ness. Married Name before 1995 As of before 1995,her married name was Arntz. Ella Hamilton was born on 14 January 1913 at Wisconsin. Ella Hamilton married Ingvald Arnold Ness before 1940. Ella Hamilton married (?) Arntz before 1995. Ella Hamilton died on 1 October 1995 at Washington, Wisconsin, at age 82. [S250] U.S. Federal Census 1930 U.S. Federal Census, by Ancestry.com, Year: 1930; Census Place: Minneapolis, Hennepin, Minnesota; Roll: 1100; Page: 36B; Enumeration District: 261; Image: 590.0; FHL microfilm: 2340835. Julius E. Fritz was born on 16 November 1907 at Wisconsin. 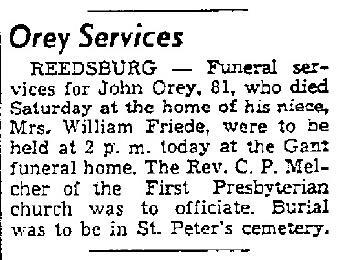 He was the son of William C. Fritz and Margaret E. Leindecker. Julius E. Fritz married Lottie M. Schramm, daughter of George C. Schramm and Nell (? ), on 18 June 1929. 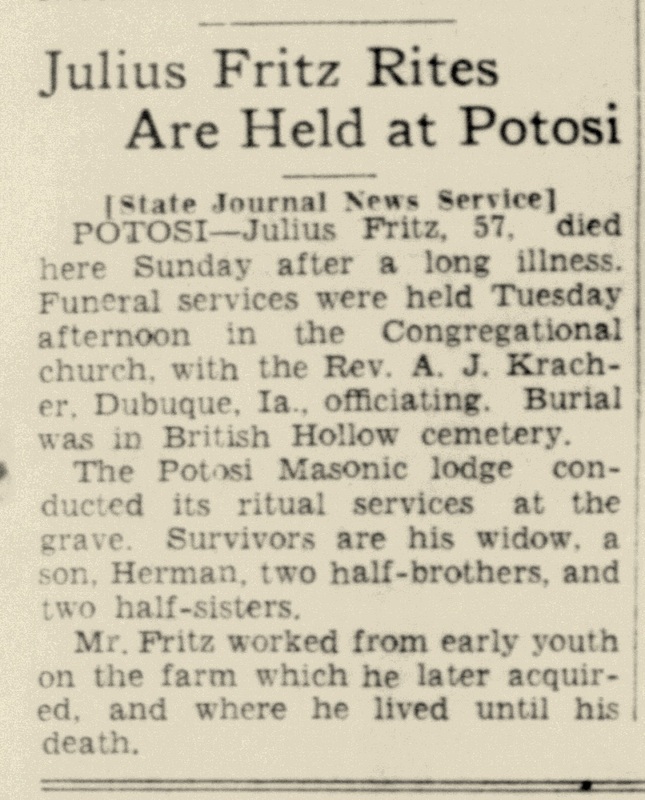 Julius E. Fritz died on 6 February 1964 at age 56. [S250] U.S. Federal Census 1930 U.S. Federal Census, by Ancestry.com, ED49. Dwelling 125. Carl Fritz was born on 16 October 1840 at Germany. He married Wilhemina Koeller, daughter of William Koeller and Johanna Tantow, on 18 September 1879. Carl Fritz died on 10 October 1929 at age 88. Carl Fritz and Wilhemina Koeller immigrated in 1887. [S245] U.S. Federal Census 1900 U.S. Federal Census, by Ancestry.com, ED51. Dwelling 116. [S244] U.S. Federal Census 1910 U.S. Federal Census, by Ancestry.com, ED43. Dwelling 229. [S243] U.S. Federal Census 1920 U.S. Federal Census, by Ancestry.com, ED123. Dwelling 90. Julius H. Fritz was born in December 1876 at Germany. He was the son of Carl Fritz and Wilhemina Koeller. 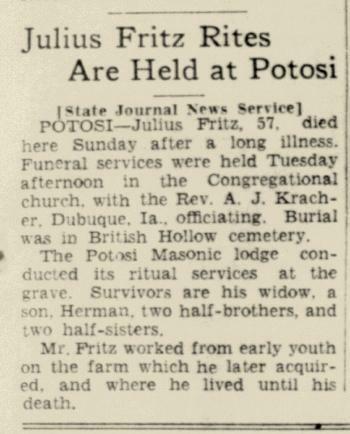 Julius H. Fritz was buried in December 1934 at British Hollow Cemetery, Rockville, Grant, Wisconsin, Julius H Fritz obituary. He died in December 1934. Julius H. Fritz immigrated with Carl Fritz and Wilhemina Koeller in 1887. [S6] Wisconsin, Wisconsin Vital Record to 1907, Volume: 08 Page: 0467. [S244] U.S. Federal Census 1910 U.S. Federal Census, by Ancestry.com, ED43. Dwelling 230. [S243] U.S. Federal Census 1920 U.S. Federal Census, by Ancestry.com, ED123. Dwelling 91. Helmut Fritz was born on 22 July 1882 at Germany. Helmut Fritz married Mary Alice Turner, daughter of (?) Turner, circa 1908. Helmut Fritz died on 21 August 1963 at age 81. Helmut Fritz immigrated with Carl Fritz and Wilhemina Koeller in 1887. [S244] U.S. Federal Census 1910 U.S. Federal Census, by Ancestry.com, ED46. Dwelling 123. [S250] U.S. Federal Census 1930 U.S. Federal Census, by Ancestry.com, ED49. Dwelling 171. Married Name circa 1908 As of circa 1908,her married name was Fritz. Mary Alice Turner was born on 5 February 1889 at Wisconsin. She was the daughter of (?) Turner. Mary Alice Turner married Helmut Fritz, son of Carl Fritz and Wilhemina Koeller, circa 1908. Mary Alice Turner had 2 with 2 living in 1910 children. Pearl E. Fritz was born circa 1910 at Wisconsin. She was the daughter of Helmut Fritz and Mary Alice Turner. Dorcas E. Fritz was born circa 1912 at Wisconsin. Mabel L. Fritz was born circa 1915 at Wisconsin. Married Name 2 September 1902 As of 2 September 1902,her married name was Clarman. Married Name 2 September 1902 As of 2 September 1902,her married name was Klarman. Emma L. Fritz was born on 20 June 1881 at Germany. She was the daughter of Carl Fritz and Wilhemina Koeller. Emma L. Fritz married George A. Klarman on 2 September 1902 at Grant, Wisconsin. Emma L. Fritz died on 24 August 1957 at age 76. Emma L. Fritz immigrated with Carl Fritz and Wilhemina Koeller in 1887. Emma L. Fritz had 3 with 3 living in 1910 children. [S243] U.S. Federal Census 1920 U.S. Federal Census, by Ancestry.com, ED122. Dwelling 44. Name Variation George A. Klarman was also known as Clarman. George A. Klarman was born circa 1872 at Wisconsin. He married Emma L. Fritz, daughter of Carl Fritz and Wilhemina Koeller, on 2 September 1902 at Grant, Wisconsin. George A. Klarman died after 1930. Name Variation Henry Klarman was also known as Clarman. Henry Klarman was born circa 1905 at Wisconsin. He was the son of George A. Klarman and Emma L. Fritz. Virgil Fritz was born circa 1909 at Wisconsin. He was the son of Helmut Fritz and Mary Alice Turner. Name Variation Wilhemina Koeller was also known as Minnie. Name Variation Wilhemina Koeller was also known as Wilma. Married Name 18 September 1879 As of 18 September 1879,her married name was Fritz. Wilhemina Koeller was born on 13 August 1857 at Germany also reported as 13 AUG 1858. She was the daughter of William Koeller and Johanna Tantow. Wilhemina Koeller married Carl Fritz on 18 September 1879. Wilhemina Koeller died on 13 March 1931 at age 73. She was buried after 13 March 1931 at British Hollow Cemetery, British Hollow, Grant, Wisconsin. Wilhemina Koeller and Carl Fritz immigrated in 1887. Wilhemina Koeller had 6 with 5 living in 1900 children. She had 5 with 5 living in 1910 children. [S250] U.S. Federal Census 1930 U.S. Federal Census, by Ancestry.com, ED49. Dwelling 128. Frank August Fritz married Viola Horsfall. Frank August Fritz was born on 12 August 1892 at Wisconsin. Frank August Fritz died on 1 August 1969 at age 76. Frank August Fritz obtained US Social Security Card at Wisconsin; last residence Lancaster, Grant, Wisconsin. Name Variation Elizabeth J. Marcus was also known as Lizzie. Married Name 30 September 1903 As of 30 September 1903,her married name was Fritz. Elizabeth J. Marcus was born circa 1878 at Wisconsin. She was the daughter of (?) Marcus. Walter Fritz was born on 18 May 1918 at Wisconsin. He was the son of Julius H. Fritz and Elizabeth J. Marcus. Walter Fritz died in January 1984 at age 65. Walter Fritz obtained US Social Security Card at Wisconsin; last residence Lancaster, Grant, Wisconsin. (?) Turner was born at Virginia. Margaret Turner was born circa 1891 at Wisconsin. (?) Marcus was born at Canada. He was the son of (?) Marcus.